In 1953, after World War II, Rotterdam rebuilt the main shopping area in it’s bombarded city centre with a radical new pedestrian only shopping street: De Lijnbaan. In vogue with the at that time new idea of the separation of functions, the Lijnbaan was the built manifestation of a new modern city. It is an open air shopping area without any cars in the streets or housing above the shops. Delivery of goods is done by a network of backstreets and housing is situated in separated highrise blocks behind the shopping area. In 2010, this unique architectural ensamble was declared a State Monument. The original design intention of the Lijnbaan esamble in 1953 was to create uniformity through diversity. The main architecture is based on the articulation of the walls between shops and a facade as infill based on a 1.1 meter grid. The original design intention of the Lijnbaan esamble in 1953 was to create uniformity through diversity. The main architecture is based on the articulation of the walls between shops and a facade as infill based on a 1.1 meter grid. All ground floor facades are different but the overall coherence is held together by the walls, the canopy and general first floor facade. While walking on the Lijnbaan doing research for this new project, we realised all other shops had rather rough and clumsily detailed shop windows, with an abundance of cheap looking stickering and logos which we think degrade the invitiveness of a boutique shop. Our design emphasizes the clear original design concept by adding a very minimal glass facade without any horizontal elements and only two vertical frames placed on the original gridlines, highlighting this grid and the walls as main structuring elements. We set out to design the sleekest facade on the whole Lijnbaan that at the same time honours the original design intentions. Our design without visible horizontal mullions make it appears that the sidewalk and canopy flow into the store without any barrier, dragging the shoppers along inside. The interior design a based on a new design language developed by PSCorp and Hyphen: CK Concrete. After a shop in Amsterdam and Dubai, this is the third shop in the world based on this urban concept focused on underwear as well as active sportswear. We implementend the interior design made by Hyphen into the existing space and designed and detailed the facade to be the most simple and transparant so that the barier between street and interior is as small as possible. Curtains by Kvadrat, concrete plaster and tiles and steel furniture form a neutral backdrop for the colourful clothing. Colourful rugs in geometric shapes add splashes of colour and highlight special items. 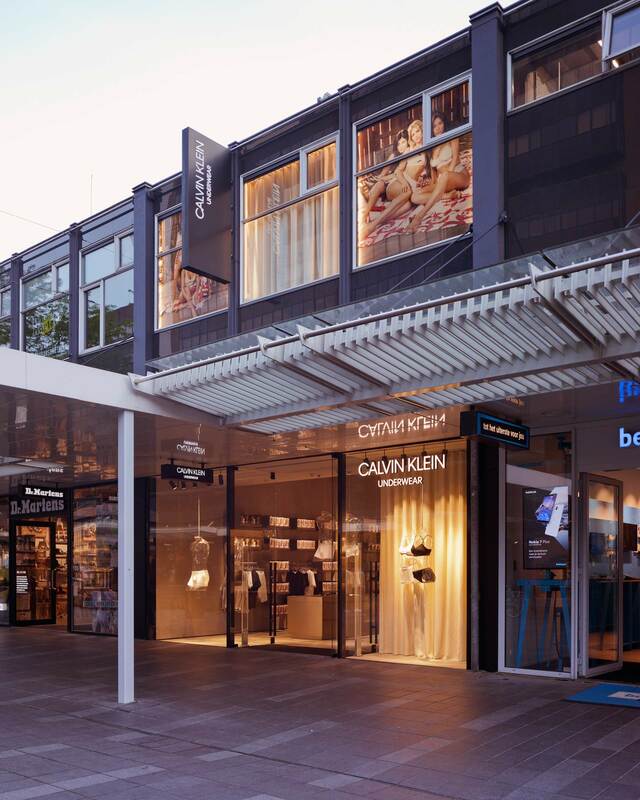 We are excited that we could contribute to this modernistic legacy by designing the facade and guiding the building permit process for a new shop for Calvin Klein Underwear. 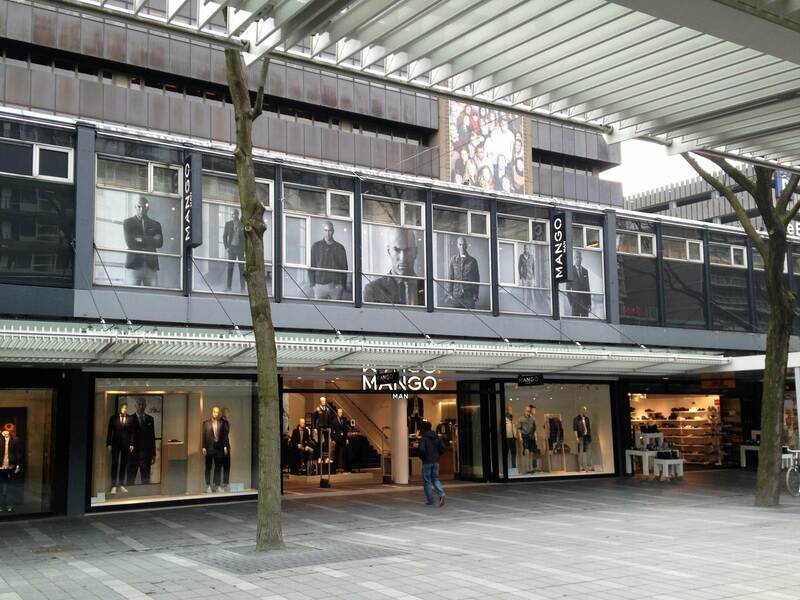 We already built up experience with this type of project by redesigning two shops for Mango on the Lijnbaan. Victor was projectarchitect for RoosRos and developed these redesigns. 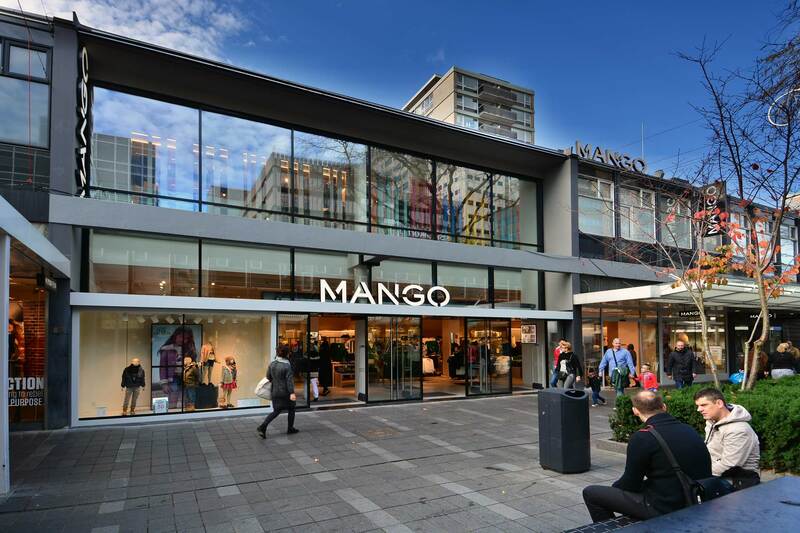 We already built up experience with this type of project in 2014 by redesigning two shops for Mango on the Lijnbaan. Victor was projectarchitect for RoosRos and developed these redesigns. photography Rubén Dario Kleimeer, images courtesy of PSCorp. Mango images by LAGADO architects.